"The narrowest escape I ever had—five more minutes, and I'd have been married!" The coming of talking pictures did more than just turn up the volume�it forced filmmakers and studios to reinvent how they did their work. The new era, marked most notably with the release of The Jazz Singer in 1927, brought an almost total retrenchment: what to do, now that we could see movie stars not just bat their eyes and emote, but talk and sing? It's no surprise that the most fluid and talented filmmakers made the transition pretty neatly (with Chaplin being the longest holdout), and in retrospect it does seem sort of obvious that the place the moviemakers would go to for inspiration is the music hall. Ernst Lubitsch was among the most nimble of filmmakers, in both Europe and America, in both German and English, and with both silent pictures and talkies, and this set brings to together four of his first sound-era movies, where we can see him meeting new challenges and triumphing in a changing medium, making for a set of films that as entertainments are little more than froth, but are a revelation when you consider their technical pedigree. Leading off the set is The Love Parade, from 1929, which is a piffle of an operetta, really, notable not for its technical elements, but for the sexual knowingness that's taken as a matter of course, the kind of thing that was completely expunged from the screen just a couple of years later by the Hays Code. Maurice Chevalier stars as Count Alfred Renard, a military man in the service of his fictional country of Sylvania—fortunately for him he's stationed in Paris, where his French accent fits right in, and he's catnip to the women of the city. (One can only hope that Sylvania and the Firefly Administration in Freedonia are keeping the peace.) He's such a rapacious Lothario that he's called back to the home office, for fear that he will sully the Sylvanian reputation abroad, and is to get a good dressing down from his monarch—the fetching Queen Louise, played by Jeannette MacDonald in full flapper mode. He's a ladies' man, and she's looking for a prince consort, so you'll never guess where this is headed. The film is full of mad, now stereotypical images of Paris between the wars—dancing girls, epic bottles of champagne, song-and-dance men in boaters, the Eiffel Tower looming romantically over all. Chevalier's thank-heaven-for-little-girls act became almost self-parody in later years, but here he's quite the stallion, and it's great to see him with a wry grin on his face, one eye on his next conquest, the other on the door to make sure her husband doesn't come bursting in. And MacDonald is fully an adult, too, not one of the infantilized women that became staples of so many 1930s musicals. Lubitsch uses the camera fluidly, and is smart about having music tell as much of the story as possible—it's not a standard book musical where a typical dialogue scene stops short as the band strikes up. Everybody here seems to be having a merry old time swilling champagne and trying to get lucky—especially fun in the supporting cast is Eugene Pallette, later a staple of Preston Sturges and Frank Capra movies as a stuffed shirt, here a froggy-voiced manservant with an epic moustache. Chevalier is on holiday for Lubitsch's next, but MacDonald has a fine time stepping out to Monte Carlo, in which she plays the Countess Helene, engaged to be married to the fop Duke Otto, but wisely hightails it to the romantic kingdom of the film's title. The pedigree of the early filmed musical gets expanded upon some here—Otto is a comic figure straight out of Gilbert and Sullivan, for instance—but Lubitsch's principal concern is with Helene and the sharpies she encounters, principally Rudolph (Jack Buchanan), close kin to the stock Chevalier character. He puts the moves on Helene by masquerading as a hairdresser, and in this pre-Hays Code world, he plays off of one of the stock figures of the time, soon banned: the sissy. The scenes of Rudolph playing it up could be straight out of The Celluloid Closet, perfect illustrations of how early Hollywood dealt with onscreen homosexuality. 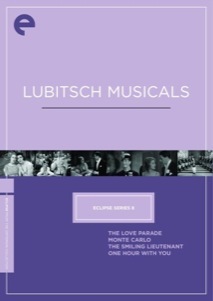 Probably most notable in the film is its signature song, Beyond the Blue Horizon, which MacDonald sings operatically with a grand chorus swelling on the soundtrack, in a kinetic sequence that was among the first showing something other than an ingénue belting out her number—in it are some of the first inklings as to how a movie musical might be more than simply a filmed vaudeville act, for here we see MacDonald going from location to location, taking in marvelous moving vistas from the train, and singing to the heavens. Also notable is the presence of silent film star Za Su Pitts, as a flirty servant who cannot get Rudolph to pay her any mind. Chevalier returns to the fold as The Smiling Lieutenant, and it's kind of extraordinary how quickly Lubitsch and other filmmakers of the period worked out the syntax of talking pictures—already here, we're operating under the same rules of film grammar that essentially still apply today. We can buy Chevalier as many things, but I don't really know that Austrian is one of them—anyway, once again he's a military man about town, who agrees to play the beard for his married friend so that he can step out with his goomah, a shapely violinist played by Claudette Colbert. As you'd expect they might, things don't go entirely according to plan, and Chevalier finds himself entangled in a film's worth of romantic complications. These radiate principally from the Princess of the fictional kingdom of Flausenthurm, and as played by Miriam Hopkins, the heiress to the throne is both deeply curious and profoundly repressed. The court is certainly played for laughs, and it seems madly antiquated, truly something Victorian, and a rapscallion like Chevalier is a testosterone-fueled bull in the delicate little china shop. Hopkins and Colbert slug it out for Chevalier's affections, and it feels like the director is finding his stride—certainly we're starting to tread on the same territory as the finest Lubitsch pictures, like Trouble in Paradise. Also, even though this is part of a musical set, it feels very much like the songs are an afterthought, not an integral part of the film's storytelling—the chamber piece is losing its appeal for the director as his style becomes more assured and fluid in the talkies. The last film in the set, One Hour With You, finds Chevalier and MacDonald reunited in that most unlikely of states for a Lubitsch picture: marital bliss. They're Andre and Colette, husband and wife, and can't keep their hands off one another—the all-singing, all-dancing gendarmes of Paris have to roust them out of parks as they nudge that much closer to pre-Hays Code public indecency. Alas, something must upset the applecart, and that something is Mitzi (Genevieve Tobin) an old "friend" of Colette's, who pays a visit and it soon becomes clear that the only thing that's on her mind is stealing her old pal's man. Mitzi is all appetite—she craves affection and cannot bear not to be the center of attention, and seeing Andre and Colette happy without her gives her a mission to drive a wedge through the marriage. She's like the operetta forerunner to Glenn Close in Fatal Attraction, and she's not going to be *ignored*, Andre. You can almost see what motivates her when you meet her droll and distant husband, played by Roland Young—he gives a wry and sly performance, and it's sort of funny to see him as the cuckold, given his memorable turn a few years down the road as the priapic Uncle Willy in The Philadelphia Story. George Cukor is given a prominent Assistant Director credit in the opening title cards, and you sense almost a tug of war between Lubitsch's sensibility and his—but Lubitsch remains the big kahuna at this point, and the decidedly Art Deco production design and the frequent breaking of the fourth wall, with Chevalier talking directly to us, is much more Lubitsch than Cukor. And we're in that rarified world of the extraordinarily rich—who among us, after all, doesn't have previews of our upcoming dinner parties running in all the local papers? Alas, that world is gone and is coming again only on repeated viewings of DVDs like these. Image Transfer Review: The standardization of aspect ratio is getting worked out through these years, along with the elements of sound�Love Parade and The Smiling Lieutenant are shot in a 1.21:1 ratio, and Monte Carlo in the modestly boxier 1.20�none of them are pillarboxed in this set, which is unfortunate, though The Smiling Lieutenant looks the best of the three, even if it sports frequent instances of bacterial decay. One Hour With You approaches the Academy ratio, which would soon become uniform; the gray levels are a little muddy, but it's the least marked up of the four. Audio Transfer Review: The mono tracks on all four films have a fair amount of static and hiss, but nothing atypical for pictures of the period. Extras Review: Consistent with previous releases in Criterion's Eclipse line, each film comes with English subtitles and brief though informative liner notes, and each disc sports color bars as well. An opportunity to watch the fabled Lubitsch touch evolve in the early days of talkies, before the moral straitjacketing of the Hays Code. The movies are both of historical interest and entertaining little bon bons in their own right.